Candy is meant to be sweet. They are a tasty treat for the little ones when they do something good like finishing their homework on time or not causing a scene at the grocery store. However, candy makers appear to be running out of ideas and have resorted to making some horrible substances and calling them candy. If you thought you had seen and heard it all, check out this list of 10 of the most disgusting candy ever. BeanBoozled jellybeans are meant for candy lovers who enjoy a little adventure. They are perfect for pranks and parties, the reason being that BeanBoozled jelly beans come in two categories; a tasty one and a sister which tastes absolutely horrible. You just never know if you are picking apple flavor or baby wipes flavor. Yes, that’s true. The candy maker thought that baby wipes, rotten egg, moldy cheese, and other disgusting flavors would be a good idea. However, if you love pranks, then this candy may appeal to you. Any other sane person should just keep their distance from this disgusting invention. Crick-Ettes do really deserve a place here and the name says it all. Insects never come anywhere close to your imagination when it comes to food and Crick-Ettes are just that. They are real Crickets that are sprinkled with various flavors. The idea that someone could in their right senses eat such a thing is out of this world. It is gross and disgusting to picture a mouthful of crickets, leave alone yours. And for that reason, Crick-Ettes can be described as one of the most disgusting candy ever. Durian is a fruit that is commonly found in Southeast Asia. The smell of Durian is horribly indescribable and so distinct that you won’t forget it easily. In fact, Durian fruit is banned in Singapore’s’ Rapid Mass Transit as well as many other public places around Southeast Asia. With such putrid smell, Durian makes it into the top ten list of the most disgusting candy ever. Candy should be a sweet smelling and tasty treat and not some horribly-smelling substances that do not deserve the name candy. This is a candy that is flavored by real fish. Jane-Jane Tasty Tuna is not a fascinating candy at all; it is gross and quite disgusting. This candy is intended for people who need to shed fat – which is an interesting concept for candy. What is even more interesting is that the sugars that make the candy comes from Tuna tidbits. The fishy smell of this candy is enough to keep your candy cravings at bay. Hotlix candy may be sweet on the outside, but that is just the sugar coating. Inside the Hotlix candy is a scorpion, a real-life scorpion. It doesn’t matter how strong your candy craving is, licking through the guts of a real, but dead, scorpion is nowhere in the dictionary for candy lovers. This is simply an insult to the good name and memories that are evoked by the word candy. This candy should not be found even in your dustbin, in your house or worst of all, in your mouth. It is so sad that someone actually dared to think that a creature as creepy as a scorpion can make candy. Gorilla Boogers are not as horrible as the name suggests, but that does not make them cool. These boogers are not made from real gorilla meat, but candy made from dried black beans that are predominantly found in Asia. The beans are sun dried, beaten into a pulp, and then shaped into small bite sizes. There is nothing interesting about them at all because underneath the sweetener they actually taste like dirt. The fact that they are called Gorilla Boogers doesn’t even help to persuade you to try it. It is even worse when you realize that there is nothing good that can come from it. Not even the taste to complement the bad name. Gorilla Boogers makes it into the list of most disgusting candies even simply because they have nothing that tastes like candy. Indeed it is an insult to call them candy. Dubbel Zout is actually made from Dutch licorice. Dutch licorice is legendary for its salty taste despite its aura of simplicity. If you are offered Dutch licorice, you may notice the weird way that the natives are taking glances at you. They may be wondering how anyone in their right mind is able to stomach the taste. There is a reason why it is called the horrors of Dutch, and it is because of its extreme taste. In fact, many natives believe that no foreigner can handle the taste. It is hard to imagine that such an ingredient can be the primary component of Dubbel Zout candy. The hideous thing about Candy Scabs is actually not the taste, but the design. They are designed in such a way that they actually resemble scabs complete with plasters. There is no plausible reason why someone saw it fit to make candy that resembles scabs. It is quite unimaginable that anyone can dare to order such, and actually enjoy it. The thought of literally licking wounds is simply not the way to get people to buy candy. The actual candy itself may not be as bad as suggested, but Ear Wax Candy still makes it into the 10 Most Disgusting Candies Ever. This is for no other reason but the horrifying name. It is beyond common sense why anyone thought that the idea of eating earwax would drive up sales. Who would you even want to lick any kind of wax? To rub more salt to the wound, Ear Wax Candy even comes with a swab as if to replicate someone swabbing their ear. Just awful and disgusting. 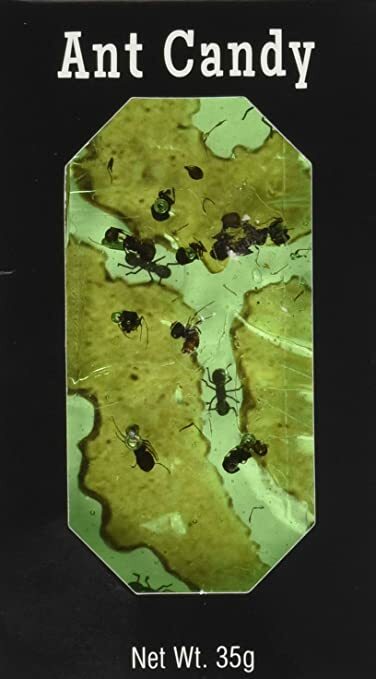 Ant Candy, as the name suggests, is a type of candy that is predominantly composed of lumps of melted sugar and dead ants. Even the packaging looks a bit scary, so why anyone would willingly buy such candy? It is simply unexplainable. The fact that there are real dead ants underneath all that sugar is enough to repulse any average Joe. But hey, these are not for the faint-hearted. You have to have a strong gag reflex if you are going to eat these without emptying your guts.